LAS VEGAS, NV--(Marketwired - April 26, 2017) - Broadcast Music, Inc.®, (BMI®), the global leader in music rights management, honored music superstar Carrie Underwood at the 69th annual BMI/NAB Dinner held last night at the Wynn Encore in Las Vegas. 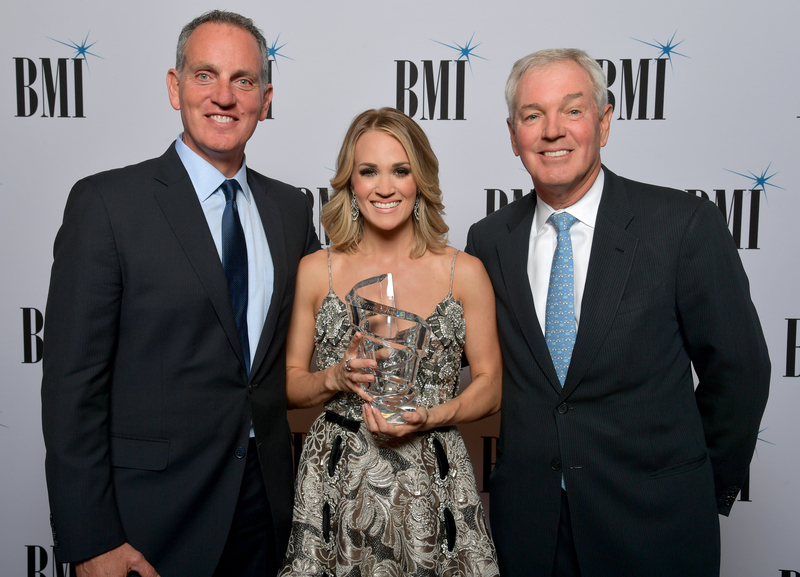 Underwood was recognized with the BMI Board of Directors Award for the impact her music has had on the broadcast industry, as well as her many contributions as a songwriter. With her string of radio hits, groundbreaking videos and television performances, Underwood was the ideal recipient of the BMI/NAB honor. Mike O'Neill, BMI's President and CEO, spoke to the room of industry heavy-hitters about Underwood's impressive career and commented that, "Not every superstar is a songwriter, but Carrie is. She has earned the respect of her colleagues, not only for her singing, but also for her brilliant songwriting and storytelling, and that is an accomplishment that cannot be overstated." In accepting the award, Underwood remarked, "I am beyond blessed to get to do what I do, and am grateful that I am surrounded by such incredible people. I love the people that I get to work with -- it's a joy, a pleasure, and a privilege. 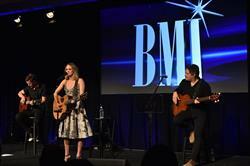 Thank you so much BMI for everything that you have done for me and my music." After her remarks, Underwood performed several songs from her impressive repertoire including "Two Black Cadillacs," "So Small," "Jesus, Take the Wheel," and "Smoke Break." Carrie Underwood emerged from the promise of her 2005 American Idol win to become a true multi-format, multi-media superstar, spanning achievements in music, television, and film. A seven-time GRAMMY® Award winner, she has amassed over 100 major honors, sold 64 million records worldwide, and recorded 25 #1 singles, 13 of which she co-wrote, with a catalog of songs that have been streamed more than 2.6 billion times worldwide. The first female artist to be twice named the Academy of Country Music's Entertainer of the Year, Underwood was recognized by Pollstar as the top female country touring artist for each of her headlining tours in 2008, 2010, 2012, and for 2016's "The Storyteller Tour - Stories in the Round." Underwood also topped Billboard's Top 25 Tours of 2016 as the leading female country artist and was the leading female artist on Country Aircheck's top country radio performers list for her success in both 2015 and 2016. All five studio albums, Some Hearts, Carnival Ride, Play On, Blown Away and Storyteller - are certified Platinum or multi-Platinum, and each an American Music Awards winner as Favorite Country Album - and tallied an incredible 40 weeks at #1 on Billboard's Top Country Albums chart. The RIAA's highest certified country album artist to debut this century, Underwood also holds the distinction of the highest album certification of any country artist to emerge since 2000 with the 8x Multi-Platinum success of her 2005 debut, Some Hearts. She is the all-time Top Country Artist (male or female) on RIAA's Digital Single Ranking, also placing her among the Top 5 females in the history of RIAA's Digital Single Program across all genres. In December of 2014, she released her Platinum-certified Greatest Hits: Decade #1, which produced two new #1 hits co-written by Underwood, including the RIAA-Platinum, GRAMMY-winning "Something in the Water." 2016 marked Underwood's fourth season as the voice of primetime television's #1 program, Sunday Night Football, and in November, she returned for a ninth consecutive year as co-host of the CMA Awards. The Grand Ole Opry member also demonstrated her diversity in 2013, starring as Maria von Trapp in NBC's three-hour holiday blockbuster, the Emmy®-winning The Sound of Music Live!, whose airings attracted 44 million viewers. The reigning CMA Female Vocalist of the Year, Underwood recently claimed her fourth win in the category amid the ongoing success of her chart-topping fifth studio album, Storyteller - the only country album to launch to Platinum certification since the time of its release in October of 2015. ** Underwood received the nine Million-Air Certificates for the following songs: "Cowboy Casanova" (2 million plays), "Last Name" (2 million), "Undo It" (2 million), "Heartbeat" (1 million), " Little Toy Guns" (1 million), "See You Again" (1 million), "Smoke Break" (1 million), "Something in the Water" (1 million), and "Two Black Cadillacs" (1 million). She has already received "Million-Air" Awards for the following songs: "All American Girl" (2 million), "Good Girl" (1 million), "Mama's Song" (1 million), "So Small" (1 million), and "Temporary Home" (1 million). Celebrating over 76 years of service to songwriters, composers, music publishers and businesses, Broadcast Music, Inc.® (BMI®) is a global leader in music rights management, serving as an advocate for the value of music. BMI represents the public performance rights in nearly 12 million musical works created and owned by more than 750,000 songwriters, composers, and music publishers. The Company negotiates music license agreements and distributes the fees it generates as royalties to its affiliated writers and publishers when their songs are performed in public. In 1939, BMI created a groundbreaking open-door policy becoming the only performing rights organization to welcome and represent the creators of blues, jazz, country, and American roots music. Today, the musical compositions in BMI's repertoire, from chart toppers to perennial favorites, span all genres of music and are consistently among the most-performed hits of the year. For additional information and the latest BMI news, visit bmi.com, follow us on Twitter @BMI or stay connected through Broadcast Music, Inc.'s Facebook page. Sign up for BMI's The Weekly and receive our e-newsletter every Monday to stay up to date on all things music. Mike O'Neill, President and CEO of BMI, Carrie Underwood, and Paul Karpowicz, Chairman, BMI Board of Directors & President, Meredith Local Media Group Present Underwood with the BMI Board of Directors Award at the 69th Annual BMI/NAB Dinner.